As part of our South Atlantic Digital Atlas we are finding out new important features about the early history of the South Atlantic margins. We have made a detailed animated video of the opening of the South Atlantic in conjunction with Dr. Colin Reeves, Earthworks, Delft, Netherlands, and Dr. Alan Smith, University of Cambridge, UK. (abstract Davison Bate & Reeves. 2004). 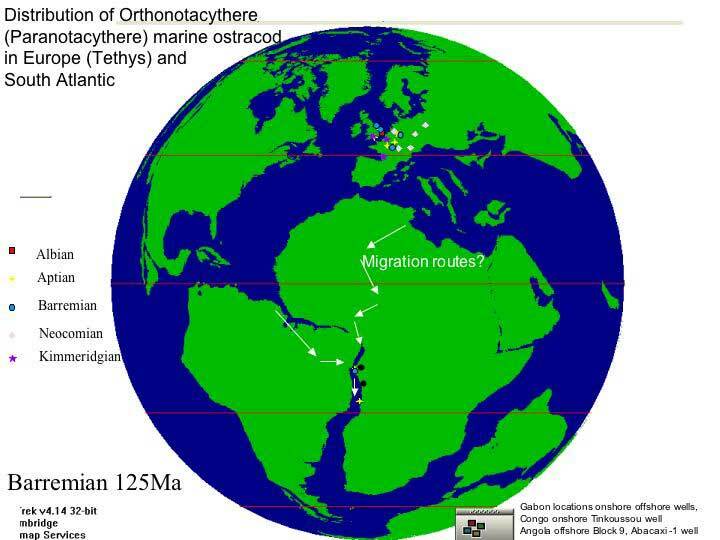 • The first marine influx was from the north and brought Tethyan ostracods and stemless crinoids of Tethyan affinity (Davison et al. 2004). • The last land bridge between South America and Africa was along the Romanche Fracture Zone in the Barreirinhas Ghana Basins, and not as previously believed in the Pernambuco-Niger delta area. Davison, I., 1988. Comment on ‘The Northeastern Brazil-Gabon Basins: a double rifting system associated with multiple crustal detachment surfaces by A.C.M. Castro Jr’. Tectonics, 7, 1385-1391. Milani, E.J., & Davison, I., 1988. Basement control and transfer tectonics in the Reconcavo-Tucano-Jatobá Rift, Brazil. Tectonophysics, 154, 41-70. Davison, I., 1991. Brazil’s many sedimentary basins offer exploration targets. Oil and Gas Journal, August 5th, 52-56. Magnavita, L.P., Davison, I., & Kusznir, N., 1994. Rifting, erosion and uplift in Recôncavo-Tucano-Jatobá Rift, NE Brazil. Tectonics, 13, 367-388. Davison, I., 1997. Wide and narrow margins in the South Atlantic. Journal of the Geological Society of London, 154, 471-476. Davison, I., 1999. Tectonics and hydrocarbon distribution along the Brazilian South Atlantic margin. In: Cameron et al., (Eds. ), Oil and Gas Habitats of the South Atlantic. Special Publication of Geological Society of London. 153, 133-151. Davison, I., 2007. Geology and tectonics of the South Atlantic Brazilian salt basins. In: Reis, A., Butler, R.W.H., and Graham, R.H., (Eds. ), Deformation of the Continental Crust: The Legacy of Mike Coward, Special Publication Geological Society London, 272, 345-359. Davison, I., Anderson, L., Nuttall, P., 2012. Salt deposition, loading and gravity drainage in the Campos and Santos Salt Basins. In: Alsop,G. I., Archer, S. G.,Hartley, A. J.,Grant, N. T. & Hodgkinson, R. (eds) Salt Tectonics, Sediments and Prospectivity. Geological Society, London, Special Publications, no. 363, 159–173.